There have been exciting advances in the management and treatment of diabetes and its ocular complications in recent years. This article will update you on the most recent diabetes advances to hit your doctor’s office and the exciting new advances to watch for in coming years. One of the biggest reasons patients fail to monitor their blood sugar as well as they should be is the inconvenience and discomfort of finger pricks to draw blood. Needleless blood sugar monitoring is hitting the market in a big way in recent years. Called Continuous Glucose Monitors (CGMs), tiny fibers on a skin patch monitor your blood sugars and send the results wirelessly to your doctor or even your smartphone. They can be set to monitor blood sugars once a day or even every 5 minutes depending on your needs. Not only does this help diabetics monitor their blood sugar without needles, but parents can rest easier by monitoring the blood sugar of their children while they are away. Many current CGM devices currently still need a once a day finger prick for calibration purposes, but in short time even the once a day prick will be a thing of the past. 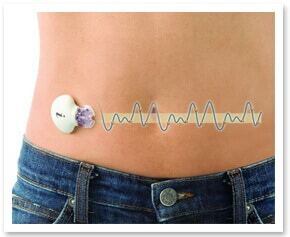 Abbott is soon to introduce its FreeStyle CGM which will not require finger prick calibration. The data from this sensor can be seen in real time and is stored for 90 days to allow viewing of glucose trends. This device is currently launched and in use in Europe and is in final stages of FDA study in the US. This will be the source of a huge change in how people monitor their blood sugar in the US within the next year. 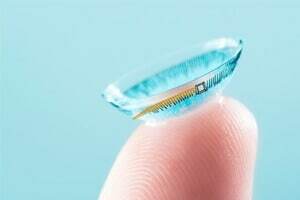 Looking a little further into the future, no pun intended, is a device being developed by the contact lens manufacture Alcon jointly with Google. This device will be a contact lens with a small sensor that monitors sugar level in your tears and translates this into a blood sugar level reading. An antenna smaller than a human hair imbedded within the contact lens will transmit the information to your smartphone or doctor’s office. Although human trials are currently underway, a formal release of this “smart contact lens” has yet be revealed, meaning it will likely be 3-5 years. Gone are the days of trying to track your blood sugar in a written journal and trying to “eyeball” trends. Even if you do not have a CGM patch, you can still benefit from new technology in blood sugar tracking. Many smartphone apps are available that let you input your blood sugar numbers digitally, with a variety of benefits over a pen and paper method. 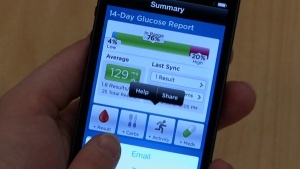 Popular ones include the apps Diabetic Buddy, Diabetes Log, and Glucose Buddy. These apps, easily downloaded onto your smartphone, show your monthly blood sugar trends, physical activity rates, give medication and blood sugar check reminders, and provide nutritional suggestions. For those on insulin, it can sometimes be easy to forget if you took your insulin. Miss a dose and your blood sugar will run high, take an extra dose and you could have serious complications from running to low. 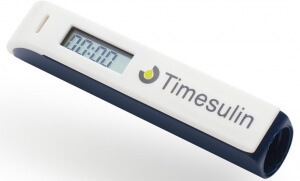 Timesulin, an insulin pen cap manufacturer, has developed a solution. Their cap fits on most insulin pens and a built in digital timer will tell you how long it has been since you opened the cap. This has recently been released in the US and can be purchased at www.Timesulin.com. For diabetics needing insulin, multiple daily injections is the number one thing they would get rid of if they could. A recent new form of insulin may just let them do that. Afrezza, an inhalable insulin, has recently been released in the US. It is inhaled through a device similar to an asthma inhaler at the beginning of each meal. Ask your doctor if you may be a candidate for this new form of insulin. Another new form of insulin is being developed by Merck, called “Smart Insulin” Every diabetic on insulin knows the dangers of accidently giving yourself too much insulin which drops their blood sugar too low. “Smart Insulin” biochemically knows the blood sugar it is injected into and can turn itself on or off depending on your need. This is currently in Phase 1 FDA trials, meaning it will be a few years before we can expect to see it widely available. Seeing your eye doctor at least yearly is important for a diabetic. Diabetic changes may be occurring in your eye long before you notice their symptoms. By the time you notice a problem, it may be too late. Early diagnosis and treatment is therefore essential. The most recent advancement in making these diabetic complications easier to detect is the OCT-Angiography. 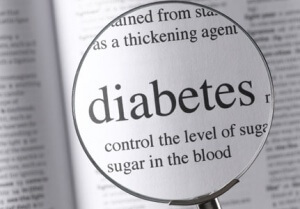 Diabetic vision loss occurs from elevated sugar levels causing blood vessels of the retina to become leaky. 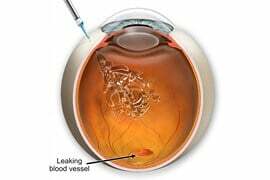 This leakage of fluid from blood vessels cause the retina to swell and become distorted. Years ago, eye doctors relied on Fluorescein Angiography to detect retinal blood vessel leakage. 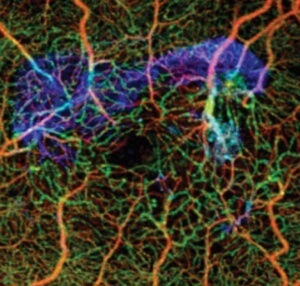 In this test, fluorescein dye is injected into the patient’s arm and photos of the retina are taken looking for dye leakage from blood vessels. Leakage of the dye was used to confirm vascular abnormalities. This is an expensive and time consuming test and often requires subjective interpretation. Complications, primarily nausea and allergic reactions to the fluorescein, were not uncommon. These complications could be serious. Due to these limitations, Fluorescein Angiography today is typically only used for critical diagnosis in sight-threatening diabetic conditions. More recently, doctors have relied on optical coherence tomography (OCT). This was a huge leap forward from Fluorescein Angiography and quickly became the standard imaging technique to detect the presence of diabetic swelling in the retina. In this test, no injection of dye is needed. Only infrared light is used to obtain extremely high quality images of retinal layers. This allows eye doctors to confirm the presence of diabetic retinal swelling without fluorescein and with greater certainty. However, OCT is not capable of detecting very early blood vessel changes before fluid leakage and swelling occur, as Fluorescein can. OCT-Angiography was just introduced and incorporates the best of both technologies by detecting the motion of red blood cells without the use of injected fluorescein. This dye-free technology gives the doctor three-dimensional imaging of retinal blood vessel flow to detect diabetic changes before the OCT could and without the complications of fluorescein dye. Because OCT-angiography is noninvasive, it will be used for more accurate diabetic examinations for early detection of diabetic eye problems and for evaluation of the efficacy of treatments. Once serious diabetic changes become present in the eye, treatment becomes essential to preserve or restore vision. 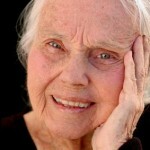 Swelling of the macula from diabetes (diabetic macular edema), is the most common cause of vision loss among diabetics. Historically, diabetic macular edema was treated with lasers, which essentially burned the macula to destroy the leaking blood vessels. This was a destructive process which caused the patient to lose vision in the hopes of preventing greater vision loss down the road. Although lasers are still required for certain diabetic eye complication, their use has become greatly limited. Recently, treatment has progressed dramatically. Not only is retinal tissues not destroyed in treatment, but most of the time there is optimism for visual improvement. Research in the past few years has found that prompt treatment of diabetic macular edema with a class of medication called Anti-VEGF (Lucentis, Avastin or Aylea), reduce blood vessel leakage and interfere with the growth of new blood vessels in the retina, thereby preventing and reversing diabetic damage. These medications work by blocking a substance called vascular endothelial growth factor (VEGF). This substance causes abnormal blood vessels to grow in the retina which then leak and cause vision loss from swelling the retinal tissues, such as the macula. Anti-VEGF drugs prevent the growth and shrink these abnormal blood vessels. These medications are injected directly into the eye. Your eye will be fully numb for the injection and most patients have no sensation of the injection.